With North Carolina entering its "blue moon" mid-term election cycle (meaning that, with the exception of a few judicial contests, no major state-wide race (for example, a U.S. Senate or gubernatorial contest) will be on the ballot this year in the Old North State), so the focus for Tar Heel political observers will generally be on the legislative districts, both congressional and state house and senate. 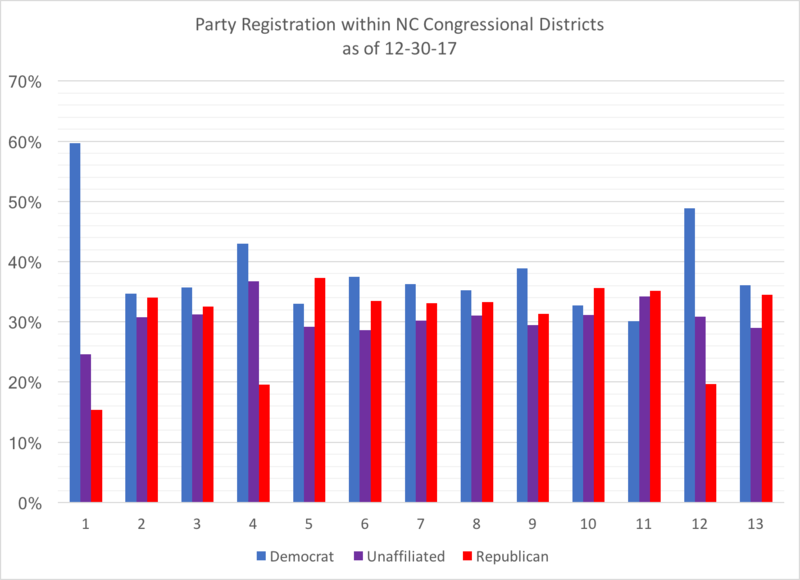 For this analysis, I'll be focusing on the thirteen congressional districts in the state and their dynamics internally when it comes to voter registration at the beginning of 2018. First, some general context for whenever we talk about mid-term elections and what we know from the past; and yes, I understand, very acutely, that some of the "rules" that we (political scientists and historians) know from the past have been either "bent" or "broken" when it comes to this current political environment. However, since we don't have anything else to rely upon when it comes to investigating and trying to understand this environment until the actual election, we need to stick with some of the basic principles that have shaped our politics, especially when focusing on mid-term elections. First, most mid-term elections typically serve as 'referendums' on the party in power in the White House, no matter their seat advantage/disadvantage in the congressional chambers. While there may be several different indicators of how to best "define" or operationalize the idea of a "referendum" on the president, but most scholars and observers view the president's approval rating as indicative of the nation's mood about the chief executive and whether his party should be rewarded or punished at the polls, through the proxy of the president's congressional candidates. While different measures are available for defining the president's approval, the Gallup Poll is one such measure that I used in constructing the following chart. 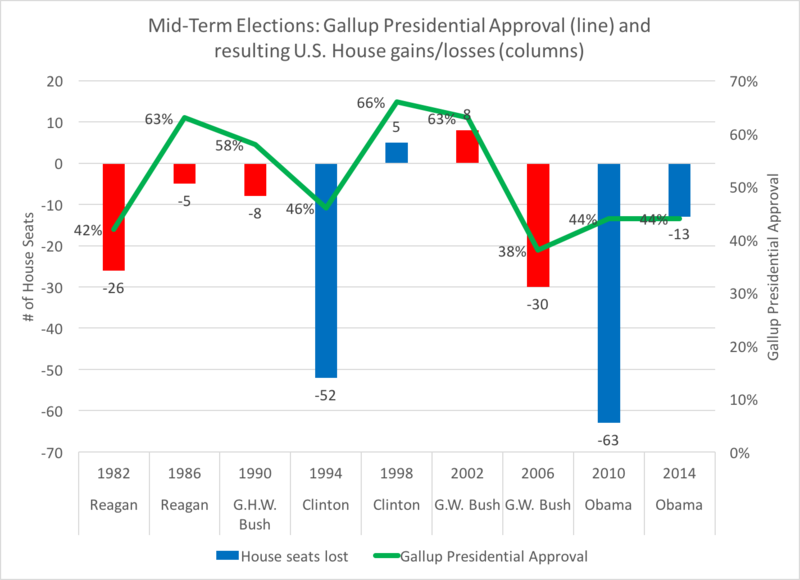 Tracking the president's Gallup approval rating (or lack thereof), I compared each president going back to Reagan with the number of both U.S. House and Senate seats gained or lost in their mid-term elections. 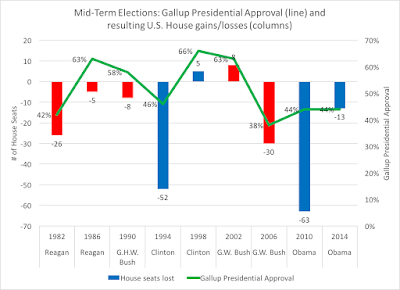 With two notable exceptions that I'll explain some political history in a moment, most presidents since Reagan have traditionally lost U.S. House seats in their mid-term elections. Even when presidents like Reagan and George H. W. Bush had approvals above 50 percent, their party still lost seats in the mid-term. 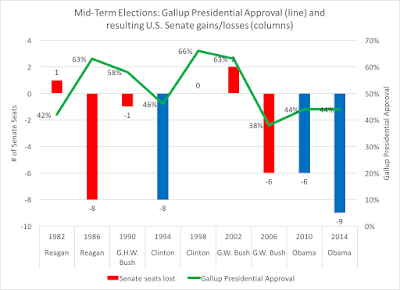 The two exceptions, meaning the presidents who saw gains in House seats, was in Bill Clinton's second mid-term and George W. Bush in his first mid-term. The most reasonable explanation of these gains was the impeachment process against Clinton by the House Republicans that turned against the GOP, and the "rally behind the commander" political environment of 2002 following the terrorist attacks of September 11, 2001. 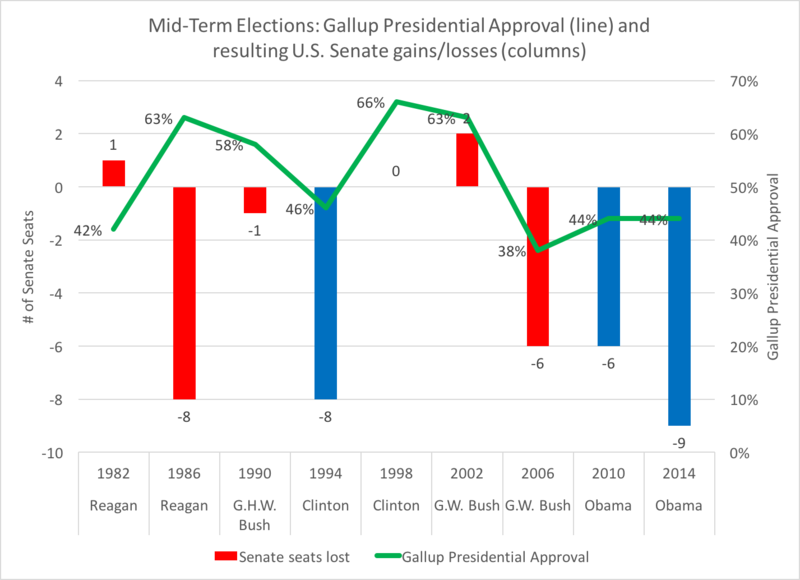 While both Reagan and Clinton saw at least one mid-term election with a slight gain/no loss of upper-chamber seats, and George W. Bush, again most likely benefiting from the 9-11 environment, added seats, the common pattern is that the president's party will suffer in the Senate during mid-term elections. One notable aspect to this year's 2018 U.S. Senate races: Democrats are having to defend 23 seats (25 if you include the two independents) compared to only 8 Republican-held seats, thanks to the Obama 2012 victory that helped Democrats in traditional conservative-leaning states like Missouri, Indiana, and West Virginia. So, what might we see come in November 2018? Again, political pundit predictions have been criticized in the past few years, but with President Trump's approval at sitting around forty percent (Gallup, as of the end of 2017, had Trump's approval at 40 percent, with the Real Clear Politics average at 40 percent as of January 3, 2018), entering 2018's election cycle seems to indicate an advantage to Democrats (see also the 2017's odd-year election Democratic wins for Virginia's governor and the special election for the U.S. Senate in Alabama). 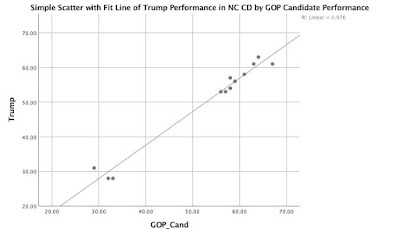 As one can see in the chart and the graph, there is a fairly close relationship between Trump's vote in each of NC's congressional district, with the line showing a 97 percent fit between the two. 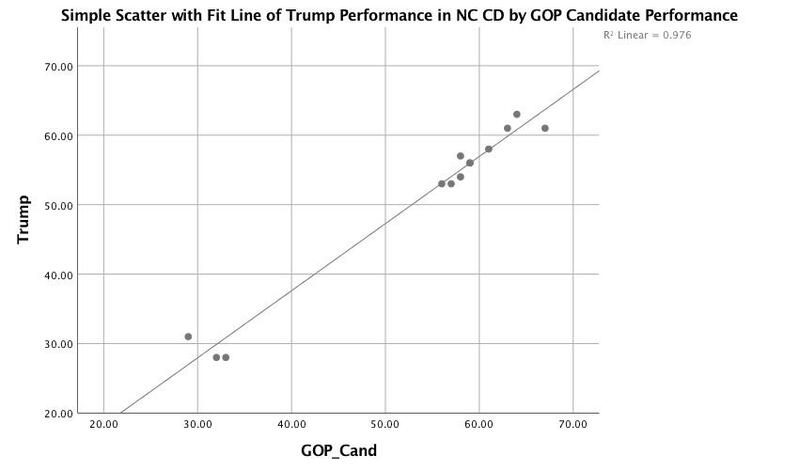 What can be deciphered by this is the close relationship between voters casting ballots for the Republican presidential candidate and for the Republican congressional candidate in North Carolina; thus, partisan loyalty happens down the ballot and the phenomenon of "split ticket" voting has decreased in recent years. Of the strong Democratic districts (1, 4, and 12), the registered Democratic percentages are 60, 43, and 49, respectively, with registered Republican percentages either 20 percent or below. We should expect, if this is a strong Democratic year, that those seats are safe (and considering that Trump's lowest performances were in those three districts, there's not that much argument about it). 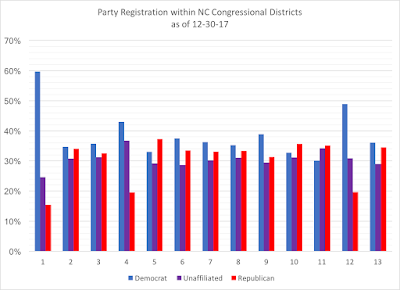 For some time, it has appeared to me that the magic threshold for NC legislative districts flipping from Democratic to Republican control has been a 35 registered Republican percentage in the district. As of the end of 2017, only three districts currently have that threshold: district 5 (37 percent), district 10 (36 percent), and district 11 (35 percent). It certainly helps Republicans to 'overperform' their presidential candidate in these districts, but the inevitable question to pose for 2018 is: how much "cushion" will these districts provide if a "wave election" is forecast to hit these districts come November? Can a six to eight point advantage over 50 percent be enough of an insurance policy for congressional Republicans to secure another victory in a tough political environment? 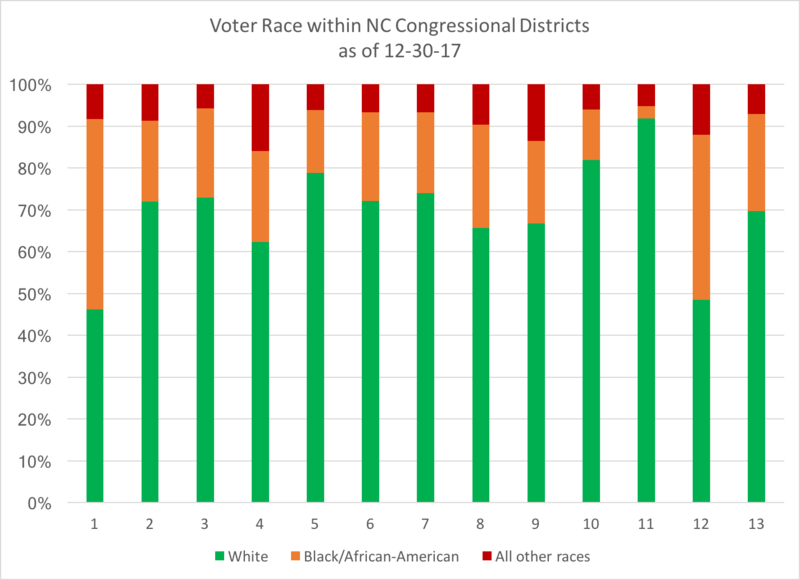 So, district 9 has a third of its current registered voters as non-white, district 13 with 30 percent non-white, and district 2 has 28 percent non-white. Two other comparisons to add to this analysis of congressional districts: by "region" (meaning, percentage of voters in urban, suburban, and rural counties within the district; classifications are determined by the 2015 OMB Bulletin; see this page for the counties listed as urban & suburban, with the other counties as rural) and by "generation" (Millennials & Generation Z being voters below the age of 35, Generation X as voters between 36 and 52, Baby Boomers who are 53 to 72, and Greatest/Silent generation as voters over the age of 73). North Carolina, like the nation, has seen its urban areas trend more and more Democratic, but unlike what some believe are the battlegrounds of the suburbs, NC's suburban counties are more Republican than the rural counties (due to higher concentrations of minority voters in rural counties). Source: NCSBE data and reclassification of counties per OMB Bulletin on urban/suburban counties. 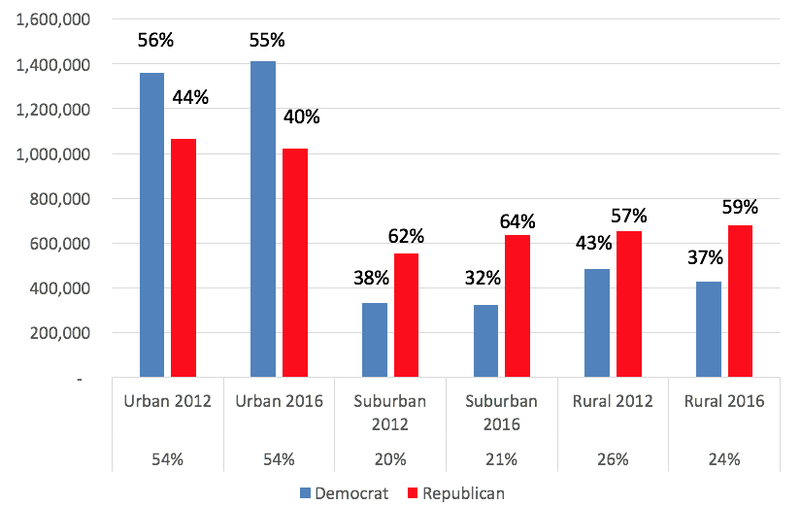 As shown, urban counties moved from a +12 Democratic margin of victory in 2012 to a +15 Democratic margin from 2012 to 2016, while suburban counties went from a +24 Republican MOV to +32 Republican MOV and rural counties went from +14 GOP MOV to +22 GOP MOV. 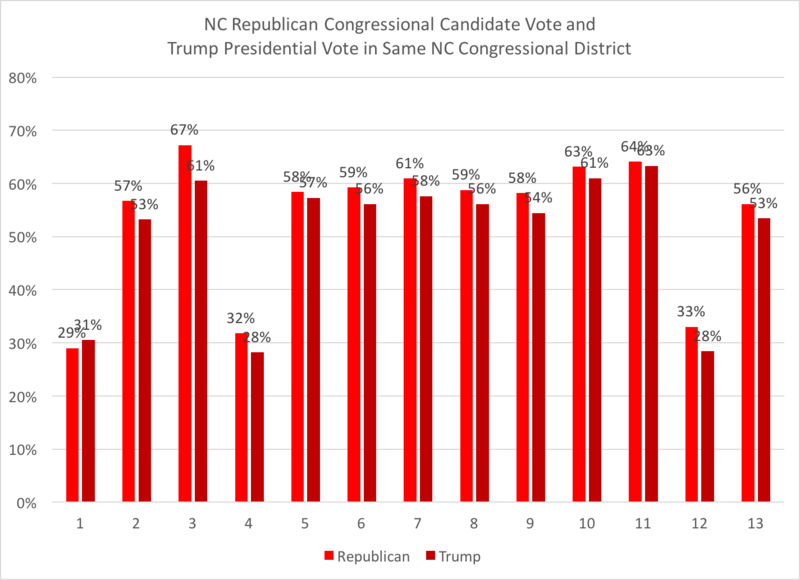 One other congressional district has an urban vote percentage like the three: district 5, with Republican Virginia Foxx. 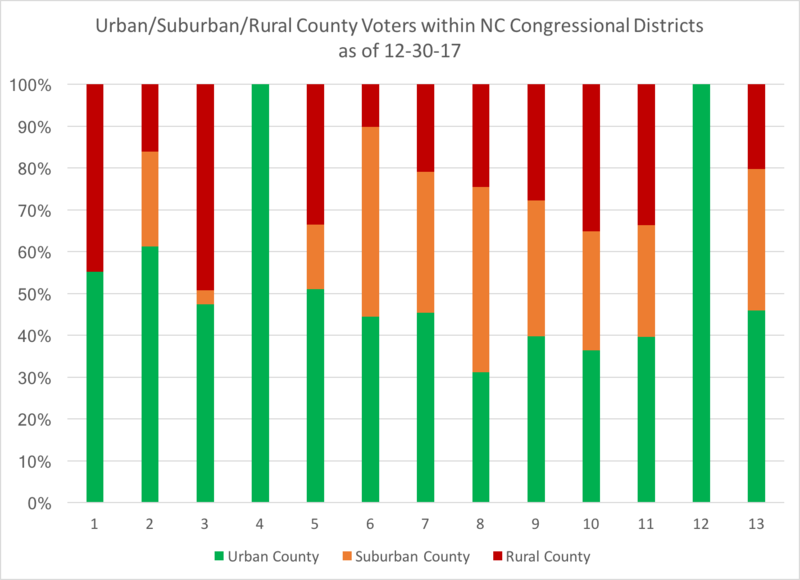 If urban areas have a higher turnout rate and suburban areas turn against the president's party, this could be another factor in what we may see play out this November. 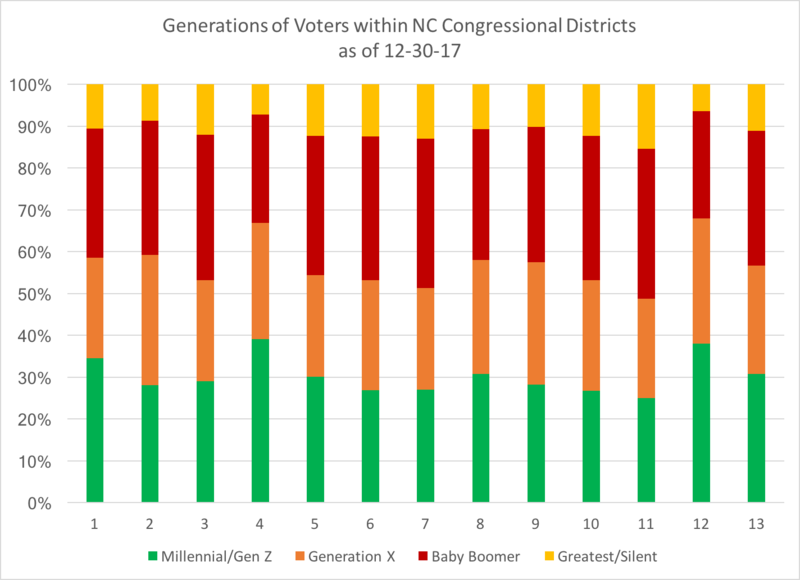 The final analysis done on NC's congressional districts is one based on generational cohorts; as noted in the previous posts, younger registered voters are coming into their own (but lack the turnout that older voters traditionally have, especially in mid-term elections). One other Republican-held congressional district has a comparably high Millennial/Gen Z percent: the 8th, held by Republican Richard Hudson, at 31 percent. Of course, being eleven months out from the election, anything can change and influence this year's mid-term elections. But as we move through the primary season and draw closer to November, minds will become made up, narratives will continue to be solidified, and some trends will become more apparent as the race for control of Congress becomes the major battle of the 2018 mid-terms. While North Carolina will only be able to contribute to the U.S. House contests, it will be worth watching what also happens in the state legislative districts for the North Carolina General Assembly. More on that in a future post. 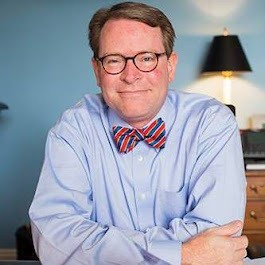 Please feel free to send me questions @bowtiepolitics and I'll be happy to consider another blog using them.